I recently got a question from Jorge in Venezuela. He’s got twins who are seemingly at different maturity levels. One of them will go to sleep pretty easily, but the other one needs more rocking and care before they go to sleep. He asks if I have any recommendations on how to handle this when the twins are at seemingly different maturity levels. When one of your twins is going to bed easily and the other one is not it does create problems. For example, you put the second twin in and they wake each other up because of crying or moving around. In this specific case, what we would do when our twins would not fall asleep or they would wake each other up is we would separate them into different rooms. We’d put one of our girls into our bedroom so she would fall asleep and the other girl in their crib in their bedroom. This way, they had a little more separation and it was a little more quiet. It was easier for them to fall asleep. And then we’d switch the one girl that was in our room to their own bedroom after they were both asleep. This worked well for us during nap time but also at bedtime when we had some challenges with our girls. 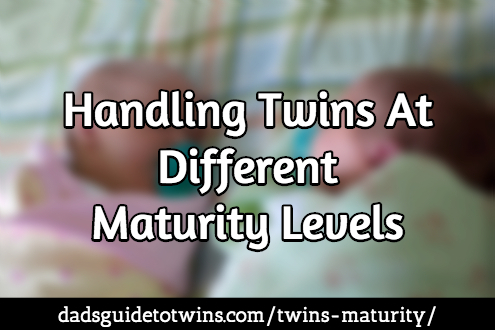 Your twins are going to receive different attention based on their different levels and milestones. Your twins are not going to develop at the same rate, even if they are identical twins. They’re going to reach different milestones at different times. And you know what, that’s okay. 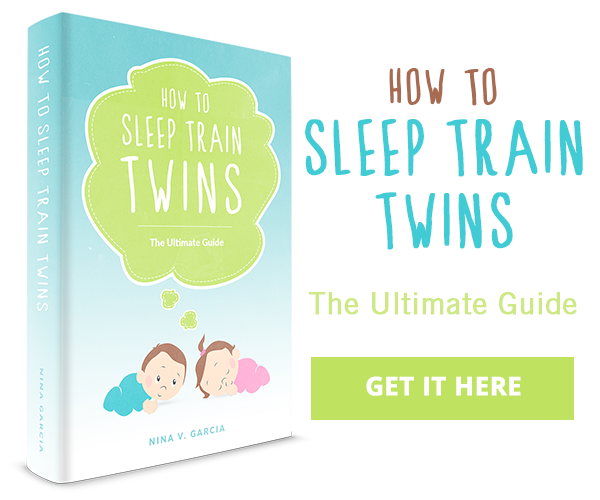 These milestones often include sleep patterns, like you’re describing — when they fall asleep, how long they sleep, when they sleep through the night, how many naps they take, how long those naps are — all those things are going to be different between your twins. Not to mention larger milestones like when they start walking, talking, losing teeth, and everything else. You definitely want to be prepared that all of these milestones are going to come at different times, probably staggered. Some of them very close to each other but not always exactly at the same time. And you know what, that’s going to be okay. What this does give you is a slight advantage as a parent of twins because you can learn from the first child. See what works. See what doesn’t. And then apply that to training the other child and helping the other child through that same milestone. In some cases, one of your twins will reach a certain milestone before the other, and that can have a impact on the sibling. For example, in the sleep example we talked about, one of the twins was going to sleep easy, and the other was not. In this case you may need to separate or buffer the child who is a little behind in maturity level to prevent him or her from impacting the other twin. However, other milestones are fine for them to be together and see each other, for example, with walking, talking, or potty-training. These are all things where the sibling who’s behind, at a different maturity level, is going to see the success and the praise and the new milestones of the more mature twin and will want to do those things. And it may in fact encourage him or her to step up and do more of those things. I talk more about raising your twins through their key milestones in my book, the Dad’s Guide to Raising Twins: How to Thrive as a Father of Twins.